Now, I’m not usually into brand bashing but how about an original idea TheBalm? A). 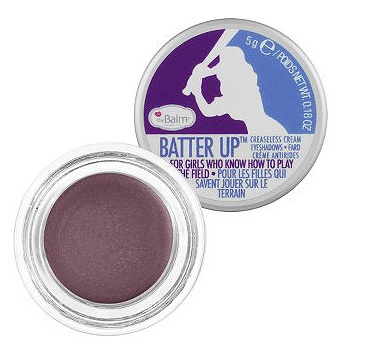 Batter Up is a stupid name. Having um said that, I think I’ll still probably try one at some point…. yano, just to satisfy my cream eyeshadow addiction. Yeah, I’m lame too. Though… perhaps not if the retail price of £18 (they’re $18 in the US) is to be believed… £18?! For a TheBalm *insert stupid name* Creaseless Cream Eyeshadow that may or may not be as good as a £14 Benefit Creaseless Cream? On yer bike. pffft. £18 is just rediculous. They may have been forgiven if they’d given us the shades that Benefit so far have not. I’ll stick to my Skinny Jeans if you don’t mind. Lets not even get started on the straight financial swap in cost, do they think we over here are financially retarded? $18 = £18….if thats not trying to rip off and insult us, I don’t know what! I use my benefit skinny jeans a lot. Not sure about this brand though. £18 is a lot. Wow, only 4 colors?! Why even try a that point. Oh, I just noticed that the question marks in your text font are gorgeous – wow, I’m a dork aren’t I? Did I just use that comment to type another, maybe? Anyway, at least put it in different packaging… it’s kind of like they aren’t even trying. Brand bashing! That’s what an honest blogger does 😀 oh, TheBalm’s packaging is all cardboard and chic … I tried their lipsticks before (comes in a newsprint cardboard tube) and it’s terribly sheer and uninspiring. It’s one thing to be similar but another to lack quality. Their eyeshadows are really rather marvellous, buttery-soft and pigmented, but this is lame. I’ve *always* thought they were just a Benefit-alike though, it’s just something about their packaging. Oh dear! *shakes head at the shame* Oh dear, oh dear oh dear! A big Nuh uh to this one! I’d quite like to try these, just to see if they can stay creaseless on my oily lids, which thus far have creased every single cream eyeshadow ever. But at that price, I probably won’t! That baseball inspired packaging is simply ridiculous! I have always felt like theBalm was an expensive rip-off of Benefit products. To me it always seemed as if theBalm’s products were packaged cheaply and in a tacky way, especially when compared to Benefit. I completely agree with all of your points (and I’m so glad I’m not the only one who feels this way)! The balm does do something diffrently than benefit. They dont test on animals. Awh, I love TheBalm and I just recently bought that purple one! It’s a gorgeous color!